Placed in the old Vicolo del Bologna alley, probably so called in honour of the sixteenth-century woodworker Alessandro from Bologna, this apartment comes alive in one of the Capital's most beautiful and animated neighborhoods: we're talking about Trastevere, a genuine piece of Roman spirit, where a plenty of young people fill up the alleys thanks to restaurants and clubs, and where any tourist can breath in the real soul of the city. You can hardly find something better than this beautiful, stylish and completely renewed accommodation, selected and designed to offer our guests a stay in a place as nice and pleasant as one might expect in such a wonderful city like Rome. And here, you can be sure you'll get the best from the Eternal City. The unit is composed with one incredibly bright, elegant and comfortable living room, with an open fully equipped kitchen, a romantic and charming bedroom and a beautiful bathroom with shower. Decorated with exquisite taste down to the small details, the apartment has the special atmosphere that beautiful things transmit to those who live nearby and there's no need to add that it is fitted with all the indispensable amenites for a convenient and satisfactory stay: air conditioning, wi-fi connection, two flat screen TVs, washer, dryer, independent heating, safe, dishwasher, toaster, kettle, refrigerator, freezer, ceiling fan and hairdryer. But also out of your door there's all the necessary to experience the city with the all comforts, both by foot and by public transportations: just 400 meters far from the apartment there's the Botanical Garden, an area of 12 hectares that houses over 3000 species of plants, Villa Farnesina, an amazing Renaissance villa that hosts Raffaello's frescoes, and Palazzo Corsini, seat of the National Gallery of Ancient Art. And you just have to cross the Tiber river to reach the Pantheon, Campo de' Fiori and Piazza Navona square, while, to move a little further on, many buses' lines are at your disposal to help you visiting the Rome's most important spots. The magic of Trastevere is due to the presence of traditions and modernity, which peacefully coexist togheter without getting in each other's way. Infact, the borough is able to radically change its features from dawn to dusk: while the smell of bread and cakes, produced by old bakeries and pastries, penetrates into the dwellings during the forenoon, in the evening everything turns. The alleys are full of Roman cityzens and tourists, who make small talk sitting at the bar, drink something at the pub or have a fantastic Italian meal at a typical restaurant. So, Trastevere becomes the city's most animated district. If you get this wonderful apartment, you'll be able to experience this ever-changing by yourself: in the morning you can stroll around the alleys which surround the flat, living the traditions and admiring the vitality of the inhabitants who work in the area. And, above all, you can breath in person the cakes' smell: for example, you can stop by the very ancient Pasticceria Valzani (at 200 meters from the apartment) and taste their typical pastries, such as the gingerbread, the Roman pangiallo, or the fantastic Sacher Torte. After a day around the city, you can turning back and choose where to eat and spend the rest of the evening. You are spoilt for choice! We suggest you to try the Trattoria "Da Teo" (Piazza dei Ponziani), where you could taste the genuine Roman cuisine, and then to have an ice-cream (during the good season) at the Bar San Calisto, an old-style cafe very busy every day. What else can I say? As a proverb says: "The proof of the pudding is in the eating"! - From Fiumicino airport: take the train FL1 that brings to Trastevere station ("Fara Sabina" direction), and then the bus H ("Termini" direction) until "Gioacchino Belli" stop. Get off and continue on foot for 2 minutes. - We can arrange a transfer service from/to the airport or station. ATTENTION: there are city taxes of 3.5euro per night per adult. Absolutely great location... a block from Piazza Trilussa (which is next to Ponte Sisto in Trastevere), No more than a 10 minute walk to Campo de' Fiori. The apartment was very comfortable with a good kitchen and living room area, bedroom and bathroom with a fine shower. The big bonus was a small room off the bathroom with a washer/dryer. The street can sometimes be a bit noisy at night with lots of young people ("Bir and Fud" is just around the corner, so you can imagine), but I really didn't mind this. Various garbage/recycling trucks come by with regularity, keeping the area very clean; though this might bother a lightly sleeper in the AM, again it didn't seem to bother me. A couple of small problems occurred during our 2-week stay - the management people were tottaly available and helpful. I would definiely recommend this apartment - but not when I want to be there! If you are nervous about renting an apartment in Rome, don't be. 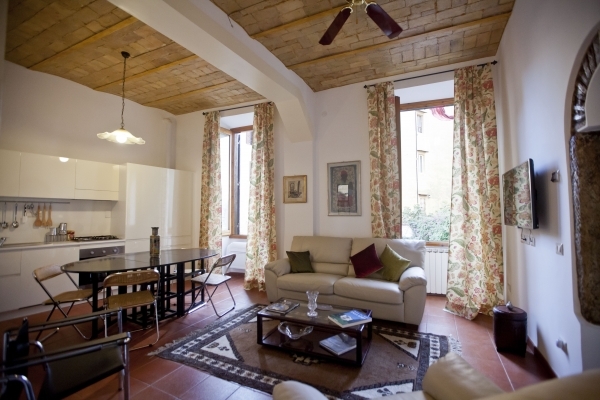 Amazing, completely remodeled apartment in a very safe, bustling area of Rome. You are literally steps from Ponte Sisto and a very short walk to Camp Di Fiori. There are excellent coffee shops, bakeries, restaurants, bars, take out food, small shops and grocery stores all within 100 yards of the apartment. The area is a mecca for Americans and other English speaking tourists so language is not a barrier (there is a cafe around the corner near Ponte Sisto that serves a full American/English breakfast if you are missing your morning eggs). Longer, but very dooable walks to the Vatican and all the sites of the main tourist attractions of Rome -- without the overpriced expense of staying in the middle of all the attractions. Our longest walk was to the Collesium / Forum. We even rented a scooter for two days (at a rental shop right around the corner from the apartment). We loved the apartment. All amenities are new. The new washer/dryer was wonderful (we carried-on all our luggage for a 10 day trip!). The wifi worked excellent and all our devices/computers connected giving us fast reliable internet access. The kitchen has everything you could ever need to prepare fresh meals at your home away from home, which we did. The apartment has tons of light and large windows that open onto a tiny piazza and running fountain on the street below. (It seemed that everyone with a camera loves the location -- literally any time we looked out the window day or night someone was taking a picture of the buildings and the small piazza). We had a few hot days so the air conditioning was key (there are new wall units in the main living area and the bedroom). It is a big city so security is always a concern. The aparment is guarded by a double key deadbolt on the ground floor and then a seperate steel security door on the second floor and then yet another door to your apartment. There is also a steel safe inside the apartment. Tons of light on the street and mostly tourists and locals wandering around at night. We always felt safe entering and leaving and had many restful nights. The owner and his staff are worth five stars alone. All emails and phone calls were cordial and helpful. The owner greated us upon arrival and his wonderful assitant showed us all the bells and whistles of the apartment. When we arrived at the airport there was a cell issue making it hard to reach the key holder, but we called Roman Reference and the staff was wonderful to deal with. This small glitch never slowed us down and the owner was waiting for us when we arrived. Simply one of the most amazing trips of our life (it was our first wedding anniversary) and the apartment -- and its location -- were a big part of our wonderful experience in Rome. If you are looking at 100s of apartments online (like we did) -- you can stop looking. Rent this apartment, you will not be disappointed. Great apartment in Rome. Great location. Walking distance to very major sites. Restaurants (oustanding fish at Checco er Carrettiere), bars, shops just nearby. Host very attentive and polite. A fantastic stay. I'd come bach here tomorrow. I saw the pictures, I read the description and I fell in love! It was love at the first sight, and I was immediately sure that this apartment would have been the perfect one for my honey moon. And it was so. Me and my husband reached the apartment late in the evening, and the host, Emiliano, was there to welcome us. He said us that the flat had been recently renovated, and we loved it even more (I like the smell of new things!). He also gave us a detailed (and useful!) explanation of the area and the city in general, and we discovered to be in the very heart of Rome: the Trastevere neighborhood is very special, rich in life and traditions, and full of restaurants, locales and shops. It was the ideal one for a young couple like us! It's also a strategic location, few minute walking from the city's most important attractions. What about the apartment? Romantic, homey, clean and comfortable are four perfect adjectives to describe it. It lacks for anything and we felt at home. We had a memorable vacation, I couldn't be happier about my choice!